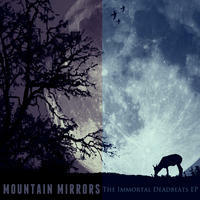 Mountain Mirrors : The Immortal Deadbeats EP. For this 4-song EP, inspired by "Sgt. Pepper's", Jeff wrote the music as fictitious prog rock masterminds "The Immortal Deadbeats". Mountain Mirrors began in a voodoo-riddled mountainside catacomb in the year 2004. There, in the pitch-black darkness, fugitive Jeff Sanders experienced a life-changing vision quest...full of beautiful demonic sirens, three-breasted cyclops oracles and small, cuddly animals. Tripping balls from an evil concoction of sensory deprivation and menacing curse vibrations, the Sandman carved the lyrics and music that would become the foundation for the first MM album, 2004's Lunar Ecstasy into those filthy stone walls. Jeff has released two more albums since then, and in the winter of 2008 he returned to that evil mountainside to work on a fourth. Ambulatory by The Wretch: painful ambient industrial noise.